Michelle Aldredge: Anna, what is your typical routine? Do you have any rituals that are important to your creative work? Anna Schuleit: When I wake up in the morning I first go outside with my dog to check on the weather and the overall feel of the day. That’s the very first thing, going outside. Then a walk or run in the woods, then breakfast. And then off to the studio for the rest of the day. Once there, I usually continue working on what I was doing the night before–a series of works, never just a single piece. If I stay long enough in the studio, just stay with the work even if it doesn’t feel great or seem satisfying or directional or conclusive, if I just stay to tend and garden, then my mind gradually yields control to the more automatic labor of painting, and with that comes a sweet spot in the process further down, a worn groove, a sense of ease. That’s a bit elusive and hard to describe, and it doesn’t really depend on any rituals other than, well…presence. Just staying with it allows it to open up. The same is true for any creative task, no? I listen to music while I work, usually abstract things. But I also enjoy the quiet, sounds from elsewhere–birds. I eat simple meals, more lunch than dinner, and I read the news when I can, or make phone calls, or run quick errands, but usually I’m in the studio for long stretches of sameness: mixing paint, looking at paintings, drawing, looking more, painting, mixing more paint, drinking some tea, looking more. And so on. Just maintaining a presence. And I do enjoy this more than I can adequately express. By the time I leave the studio at night I often feel deeply connected to my work, and I have to tear myself away like a kid from a playground. The process feeds itself, somehow, and I get to be a part of it, which is the best and simplest, and most tumbling and humbling feeling I know. What do you do when you hit a roadblock or get stuck on a certain piece? For the past six years I’ve been working in series: multiple panels of drawings and paintings that help prevent the formation of serious roadblocks by creating a multitude of views of the same thing. That means there are multiple options spread out across more than a single pictorial plane, side-by-side, which means repetition, which in turn, means a built-in possibility for continuation. I try to keep going at the speed each particular piece seems to require naturally, some slow, some fast. Slow for me means more than a month, and I actually have several works in that category right now, large paintings on linen. They just seem to need more time to remain “open” while I keep them around, keep looking without specific expectations other than to stay engaged. When I do get stuck and nothing moves forward for several days I will take a snapshot of the painting and enlarge it at a copy shop onto a large piece of paper, which I bring back to the studio with me. I cut the copy apart, paint on top of it, and use it as an impermanent collage. It gets me back into the work through a back-door and lets me see the colors and the composition differently, which can be crucial to getting unstuck again. But that kind of roadblock is ultimately part of the piece like all the rest, a sort of necessary detour. I love the combination of intense creative energy and controlled order in your studio. Can you explain how your studio is organized? My studio is one large space subdivided into several parts: paintings on the walls, drawings and prints on tables in the middle, paints and inks and dry media and other tools in-between, and books and papers on the fringes. The different parts of the studio help me to keep moving, like stations along a road. Things are in flux though; it’s definitely not overly neat, nor is it too tidy. But it’s not chaos either. It’s a good, medium kind of state with room for dried paint and dust and empty bottles and clothes and traces of use. And there are large, handsome industrial windows overlooking a row of trees. Oh, and lots of lamps and spotlights, since I work at night, too. Working at night makes all the other things that aren’t part of the paintings fall away, adding contrast and saturation and a kind of temporary authority in the composition that the next day supersedes again. I’m intrigued by the creative connections that exist between these ordinary objects and your artwork. On your work table, for example, is a pile of antique shoes, which sits beside a sketchbook depicting feet, stockings, and a person curled up on a yoga mat. I see that you are exploring some of these visual ideas in the paintings hanging on the wall. Can you tell us more about these images? You have had studio spaces in New York, Massachusetts, and other locations. Your current studio space is housed in a renovated mill building in the historic town of Harrisville, New Hampshire. What are the advantages and disadvantages of creating art in a quiet, rural community versus in a bustling metropolis like New York City? Working in a studio in New York means continually keeping the city at bay. Urban seductions sneak into one’s days at all hours, and are as unstoppable as water. It’s a useful exercise for artists to learn to build dams against distractions so that the work gets to be the most important force and can speak loud and clear. Time slips away at such a rapid pace if there are even just two extraneous things scheduled in a day other than one’s studio work. And time is still the key ingredient to growing something. Now I’m working four safe hours away from New York, which means I’m here most days and most hours, automatically, just by being too far from the city to be spontaneously whisked away from something I’m doing. Instead, I get to plan my distractions in advance: trips to New York with visits to galleries, museums, bookstores, friends’ studios, etc. Meanwhile, this small town holds me gently, and simply, with its tiny post office and general store and a lake to swim in when it’s warm. On the spectrum of distractions, Harrisville offers the bare minimum, up only a notch from a deserted island, which I’ve once had a chance to try and love, and then moved on from. I know now that I need a sprinkling of human contact in an otherwise quiet and free-running day of painting. But I miss the whirling city, and I admit to courting it in my mind often. It’s a continuous mix of wishing and longing, and of getting what I want, and also never really getting it at the same time. Speaking of keeping distractions at bay…What is the relationship between technology and your creative work? How do you keep technology from invading your creative space (both your mental space and physical space)? That’s probably the Gordian knot of our times, no? How much “tool” do we require to enable expression? How easy it is to sink oneself into the relationship with a piece of technology rather than into the relationship with the thing that the technology was acquired to facilitate, the thing itself, the treasure. What is the treasure of our creative life? Is it a single late painting coming out of hundreds before? Or is it a lone novel? I do think now, and this probably changed over the years since art school, that the treasure is one’s whole sweep of trying. Not letting go of a direction, a motion, once under way. And if that’s so, then technology to me as a painter, computers especially, are easily exposed as another complex form of distraction. Complex why? Because they carry the good with the bad in one potent mix: access to information alongside rivers of crap. I try to have as little of it as possible. I don’t watch TV although I do love movies, I use email but I rely on a temperamental public wireless network here in town, I drive a car but I don’t use an electric can opener. So, on the spectrum of technology consumption I might be found somewhere in the hazy middle: not addicted but dependent. And wishing for less, by which I mean more direct interactions, experiences, touch. More actual risk. The question is how much mediated experience (such as GPS) vs. how much raw experience each one of us prefers and needs? I prefer the raw, I think, even if it comes with erroneous roads, detours, and delays. On a related note…a lot has been written recently about technology’s negative impact on our attention spans. It occurs to me that our shortening attention spans impact not only our ability to be alone with ourselves and create as artists, but also our ability to appreciate and experience art as viewers, readers, and listeners. When it comes to finding an audience for your work, is painting at a particular disadvantage as a static, two-dimensional medium? How long does anyone stand in front of any painting nowadays, simply looking at what’s there (not what it means or who it was painted by or how much it’s worth)? As an art student I was always a little envious of a book’s time-based spell over a reader, the extended duration readers spend inside the pages of a story, entrusting themselves to that particular type of transport. Books, like movies, music, dance, any performance art form, are time-based media, while painting is not. One can “see” an entire painting in a few seconds and claim to have seen it, and move on. There is no built-in duration to a painting’s reception; it lies open and still. In that, it is less exciting, generally, than anything on a screen, is my guess. But people are still looking at paintings last time I checked, and they probably always will. The critic Robert Storr once scornfully described painting as a “senile grandmother living in a family. She has been crazy for a long time, she urinates and defecates, but everyone in her own family knows how to treat her, how to talk to her. No one is surprised at what she does.” Yikes. What a sneering verdict of obsoleteness: the old crazy predictable grandma. (Note that he didn’t say “grandpa”). Anyway. Such conviction! Such fervent finality! And what an inspiration to keep painting despite it all. Cézanne, who committed his life to observing ordinary things in extraordinary ways, once said, “The day is coming when a single carrot, freshly observed, will set off a revolution.” I believe it. One of the things I enjoy about your work is your range as a visual artist. In addition to being a painter, you are also known for your large-scale, interactive installations. The contrast between these two mediums is quite striking. Your installations require an incredible amount of planning, organizing, collaboration, and engagement with others, while painting is a solitary practice. What do you find most rewarding and most challenging about painting versus installation work? How do you balance these two sides of your artistic practice–the introverted painter versus the extroverted installation artist? What I’m drawn to is the sense of play, a certain kind of playfulness, in both paintings and installations. But paintings rely on one person alone, while the installations require the participation of many other people, are mostly linear productions with definite endings. But aside from the scale they are not that dissimilar, each can feed and energize the other. Last year I completed an outdoor commission for UMass Amherst, Just a Rumor, which combined the two media in a single work, connecting a two-dimensional painting with a nearby pond and ducks in a public place, on a large scale. To see the work, the viewer had to find the spot, the bench, from which to view it. But it was still simply a painting, using the pond as a natural surface for projection, no electricity, no devices, no tricks—just a pond. I enjoyed that a lot. 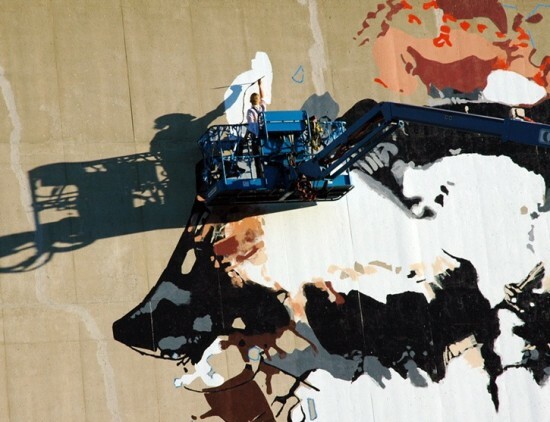 I loved painting on a boom lift, for days, not knowing how it would come out, how it would travel across the distance to where the bench is located. It turns out that it traveled fine, but it was a gamble. We didn’t know whether it would work. So many artists struggle to maintain a balance between their creative work, family and social life, day job, etc. You grew up in Germany in a family of artists. How has this informed your own views on the subject? How do you achieve a balance between these competing interests in your own life? Growing up among artists meant that the life of an artist was considered normal by everyone closest to me. Not special, not glamorous, not precarious or worrisome, just normal. And that meant that the demands of making a living as an artist while keeping the work alive and in the forefront, weren’t so scary to me. Family and art were the same thing to me then, and still are. As a teenager I was assisting my mom with her art, which was intense for me. But it also brought us close. She’s one of my most honest critics, colleagues, friends. I owe so much to her, especially the no-nonsense attitude to making your art, the sense of normalcy and daily continuum. A deep inspiration of mine comes from having watched her in her world, achieving her own kind of balance as artist and mother of five children. If she was able to balance it somehow, I’m hopeful that I’ll be able to as well. Can you talk about some of your early struggles with creating art and making a living? Did you have any crazy day jobs when you were starting out? What were some of the most discouraging moments in those early years? What kind of impact did winning a MacArthur have on your creative life? My family always encouraged us kids to work, and I found my first job at twelve, working for a grocer on Saturdays. I also delivered newspapers, and worked as an usher at a classical music festival. Later I was a resident assistant in the RISD dorms, and when I graduated I worked for a horse trainer. Then I moved to NYC where I did web design and tried to sell handmade sketchbooks on the streets, which didn’t work out. In grad school I worked in catering, in the libraries, and in a juice bar, and I lived in the attic of a nursing home staffing the night shift. When I moved back to NYC I found my two favorite jobs: at the MTA’s “Arts for Transit” (art in the subways) and at Nightingale Bamford School, teaching art. None of those jobs were discouraging, just challenging in that they took over most hours in the day and left little time for work in the studio. And now—I’ve been in my studio full-time since 2007, which was made possible through the enormous, humbling gift of the MacArthur Fellowship, allowing me to stay and stay and stay with the paintings as I had always wanted, seeing them through to a point when they’re ready to go out into the world. This is then, I could say, my first unhurried body of work I have ever produced. I put all my time into them, with only a few interruptions. And yet it feels like it’s all only just beginning, too. Can you share some of the meaningful advice that has influenced you as an artist? Do you have advice of your own to share with struggling artists? One of the early, fundamental bits of advice came from David Frazer, my painting professor at RISD, who said, “You can’t think your way to a good painting—you have to paint your way there.” And Max Beckman said something to the effect that when you get there, don’t back out; too many times you don’t exhaust the material. Stay. Go deeper. Along the same lines, it was Alan Lelchuk, my writing professor in grad school, who said to us in class: “Too often you will waste your best scenes by not giving enough. S-l-o-w down, take your time.” And then there’s Chogyam Trungpa who speaks about the artist’s life: “You have to start by paying attention to reality. You need to learn to eat properly, to cook properly, to clean your house and to work with your clothes. You need to work with your basic reality. Then you go beyond that, and you begin to have something much more substantial.” Sounds obvious, no? But it’s so frequently neglected. Then, once you’ve had a modicum of success, some kind of recognition giving you some kind of an audience, I suggest reading Tennessee Williams’s “On a Streetcar Named Success”. If you’re feeling lonely, read Rilke and Van Gogh. If you’re feeling restless or frustrated, read Agee and Vonnegut. If you long for a more gutsy abstract approach to your work, read Canetti or Beckett’s short prose. And so on…. it’s always been reading for me. But you know, good advice is really anything that keeps you afloat via a sense of shared struggle. Good advice is the kind that tugs at your heart a little, since it addresses something you know you need help with, be it focus, authenticity, endurance, fearlessness, etc. Ultimately, this is what I repeat most often to myself: avoid tip-toeing around, Anna. Stay. Go deeper. DON’T LEAVE. What’s been fuzzy then gradually falls into place around me, into a more solid, observable, bearable state.